Click to read more about: What is an echocardiogram? An ECG – or an electrocardigram - is a simple and useful test which records the rhythm and electrical activity of your heart. Small sticky patches called electrodes will be put onto your arms, legs and chest. These are connected to an ECG recording machine, which picks up the electrical signals that make your heart beat. The machine records a few beats from each set of the electrodes onto paper. The test will only take a few minutes and is painless. An ECG can detect problems you may have with your heart rhythm. It can help to tell if someone is having a heart attack or if they’ve had a heart attack in the past. Sometimes an ECG can indicate if the heart is enlarged or thickened. What is a 24-hour ECG recording? This means that your heart will be continuously recorded by an ECG for over 24 hours – your doctor might also call it Holtor monitoring or ambulatory ECG. What will happen during my 24-hour ECG? You’ll have electrodes put on your chest and the wires attached to these will be taped down. These wires will lead to a small portable tape recorder, which you’ll wear on a belt around your waist. What can a 24-hour ECG show? A 24-hour ECG helps to diagnose symptoms, such as palpitations which only happen now and again. Sometimes it can show up an abnormal heart rhythm that might need treatment. It can also help to reassure patients if the results are normal. What are cardiac event recorders? If your symptoms are less frequent, your doctor might suggest using a cardiac event recorder which can record the heart's activity for a longer period of time or whenever symptoms occur. There are several different types of event recorders - some are portable and you hold them to your chest when you have a symptom. These are called patient activated recorders. There’s also a device called an implantable loop recorder, which is implanted under your skin. Your doctor might also refer to this as an exercise stress test or an exercise tolerance test. It’s an ECG that is recorded while you are walking on a treadmill or cycling on an exercise bike. The idea of this test is to see how your heart works when you are more active. You should wear light, comfortable clothes and shoes and avoid having a heavy meal a few hours before the test. Sometimes your doctor may advise you to stop taking certain heart medications for one or two days before the test. What will happen during my exercise ECG? 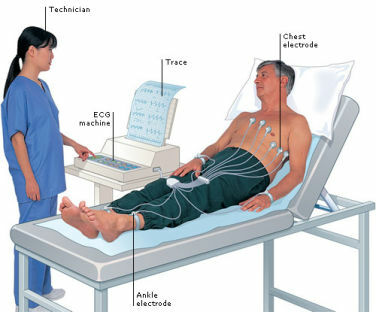 Electrodes will be put on your chest and you’ll be asked to walk on a treadmill or cycle on an exercise bike. The test starts off at an easy rate, and is gradually made harder either by increasing the speed and slope of the treadmill or putting a break on the bike. A doctor or technician will carefully monitor your ECG at regular intervals throughout the test. Make sure you let staff know if you have any symptoms such as chest pain or discomfort or if you get very tired or short of breath during the test. The test usually lasts from a few minutes up to 15 minutes. Your heart needs more blood and oxygen when you are active and the exercise ECG can show if your heart is not getting enough blood from the coronary arteries during physical activity. This can help doctors find out if coronary heart disease is present or how severe it may be. An exercise ECG is also helpful for looking at how well the heart is working after angioplasty or bypass surgery. An echocardiogram (also known as an echo) uses sound waves that echo against structures in the heart to build up a detailed picture of the heart. This test is done to look at the structure of the heart and how well the heart functions. It is a similar sort of scan to the ultrasound scan used in pregnancy. How is an echocardiogram done? Lubricating jelly is rubbed on the chest, and a probe (recorder) is then placed on the chest and a pulse of high frequency sound is then passed through the skin. The probe picks up the echoes reflected from various parts of the heart and shows them as an echocardiogram - a picture on the screen. The echocardiogram can give accurate information about the pumping action of the heart, and about the structure of the heart and the valves. It can be a useful test if you have recently had a heart attack of if you have heart failure. It is also used routinely to assess people with disease of the heart valves and people with congenital heart disease. An echo is especially useful for diagnosing heart disease in newborn babies and infants as it is easy to do and painless. Occasionally an echocardiogram is done while the heart is done while the heart is under stress - by increasing the heart rate either with exercise or with medication. This test is used when doctors need a closer and more defined image of the heart valves. Detailed pictures of the heart are taken from the oesophagus (gullet) which lies behind the heart. You may have a mild sedative to help you relax and an anaesthetic will be sprayed on the back of your throat. You will be asked to swallow a small probe which is mounted at the end of a thin flexible tube. While the probe is in your oesophagus it takes pictures of your heart. Once the procedure is done the tube is then gently withdrawn.